Based in beautiful West Palm Beach, Florida, the National Croquet Club's membership spans the globe. We are proud to claim the Charles P. Steuber National Croquet Center as our home. We extend an open invitation for you to visit us anytime. USCA Members can check their handicaps here: Handicaps. LEARN, PLAY & EXPERIENCE THE FUN OF CROQUET. Welcome to the National Croquet Club (the Club) Home Page. The Club is the largest in the US, and is headquartered at the Charles P. Steuber National Croquet Center (NCC), owned and operated by the Croquet Foundation of America (CFA). The NCC is the largest and finest dedicated croquet center in the world. It resides on ten beautiful acres in West Palm Beach just minutes away from Palm Beach International Airport. It is just a block away from Trump International Golf course, The Palm Beach Zoo, and The Science Museum . The NCC has a 19,000 square foot, Caribbean-Colonial-style building that provides headquarters office space for the CFA, the United States Croquet Association (USCA), and the National Croquet Club. It also houses the Croquet Museum, the Croquet Hall of Fame, and the largest croquet shop in the US. It is also home to our in-house caterer, Sandy James Fine Food & Productions -- one of Palm Beach County's finest caterers. The Center is a haven of peace in a bustling world. Inside you will find wide entryways; gracious space for dining; an elegant lounge; and two ballrooms upstairs for dinners, dancing, or meetings, or a combination thereof. It is surrounded by wide verandas overlooking four acres of lush lawns that are the equivalent of laser-level putting greens (105’ X 84’ each). These qualities make it an ideal party space for almost any event. Click here: www.croquetnational.com to go the the National Croquet Center website for full details of the building, its capacities and its capabilities. Why is the Croquet Center offering party or meeting space? They want everyone to come and see that croquet is no longer just a backyard family game; or a game of the idle rich, or an “old folks” game. In its four variations, it can be all or any of these, but in reality is so very much more. It is now a serious sport with serious equipment. It offers unique benefits to its players -- young and old -- and is a game that should appeal to almost anyone, young or old; male or female. It can be highly competitive, playing with a handicap system in frequent tournaments throughout the US and internationally at public spaces and at the finest clubs and resorts, or just for fun and relaxation locally. Croquet is low impact (just walking, bending and swinging a roughly two-to-three-pound mallet between your legs to hit a one-pound, solid plastic ball), yet it can be highly competitive, strategic, and mentally stimulating, with a major social component where you will make many new friends. All of these characteristics are proven to benefit health, mental acuity and longevity. 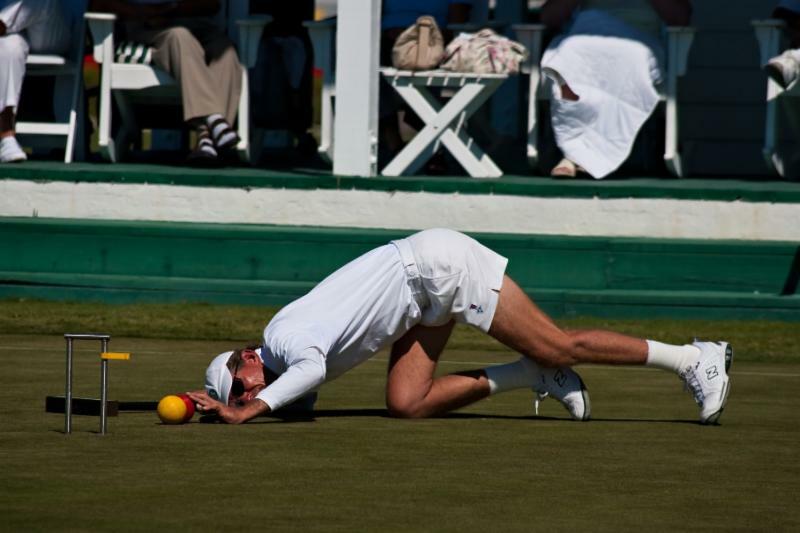 Croquet is not just a sport, it's a lifestyle. Learning the game is a rewarding experience for young and old alike. It is a game you can play for a lifetime -- and make friends for life. The main building has fine dining by Sandy James Fine Foods, the in-house caterer to the National Croquet Center. They are also available for memorable special events; corporate outings, weddings, etc. If you are planning an event, it isn’t required that it includes croquet, but it is highly recommend for something different and fun. Either way, our purpose will be served if you and your guests simply see the facility and understand that this is a serious competitive sport that you can take up successfully at any time of life. Come visit the National Croquet Center today and experience for yourself the fun and competitive nature of the game. The Center is open daily from Monday - Saturday 9:00 AM - 5:00 PM. The courts are open daily through Sunday for Club Members starting Mondays at 1:00 PM. Phone: 561-478-2300 Ext. 3 for more information on how to become a Club member, or to schedule your next event. You will be glad you did. Come for a free lesson and game at 10:00 AM any Saturday (reservations required), and we will teach you and your guests a simple, single-shot game called golf croquet that can be learned in minutes, is great fun, yet it becomes more and more strategic as your talent grows. This remarkable limited edition 11" x 14" full-color, table-top book clearly illustrates the artistry, emotions and camaraderie of competitive croquet by combining the dramatic, gallery-like photographs and portraits by Bob Chilton, exhibited photographer, philanthropist and championship-level croquet player, with the delightful narrative and captivating prose of John Osborn, writer/reporter and multi-year National Croquet Champion. Together they have captured the beauty of this sport, showing its players in all their diversity and explaining why we play the game. Click here for more information about the formats available for purchase. Use the Order Form to get yours today! Additional croquet event schedules are available at the USCA Web Site.